The proliferation of two-ounce antiqued silver coins featuring ancient gods doesn’t mean the format is tied to that genre. The New Zealand Mint has taken it and produced a strictly historical range of coins, taking a look at six of the greatest explorers the world has ever known. Two Portuguese, two Brits, a Spaniard and an Italian, mean it’s a strictly Eurocentric selection, but there’s no denying that all have firmly earned the right to be lauded for tyheir adventures. Definitely a series that could have continued, it’s nevertheless good that it’s rounded up in a nice tight, collectable set. What was most surprising about these coins was the rapidity of the releases. 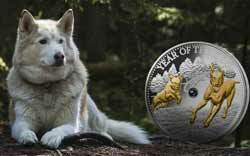 With the first coin debut being in June 2015, the last came out just nine months later in March 2016. The New Zealand Mint has accelerated many of its coin series over the last couple of years, mostly the small five/six coin sets, as it’s moved more and more into licenced properties like the Disney and Star Wars ranges. We’re not sure how this worked out for the mint given these are two ounces in weight and coming in at $145.00 each, but they’re still doing it, so obviously not negatively. Unusual packaging and a cool subject matter help lift this series above the norm. 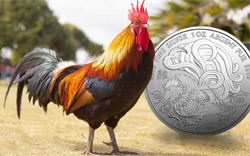 At the time of writing all six coins are still available from the New Zealand Mint website. Marco Polo (1254 – 1324) was an Italian merchant traveller from Venice, who recorded his travels in Livres des Merveilles du Monde (Book of the Marvels of the World, also known as The Travels of Marco Polo). This account did much to introduce Europe to Central Asia and Chinese culture. 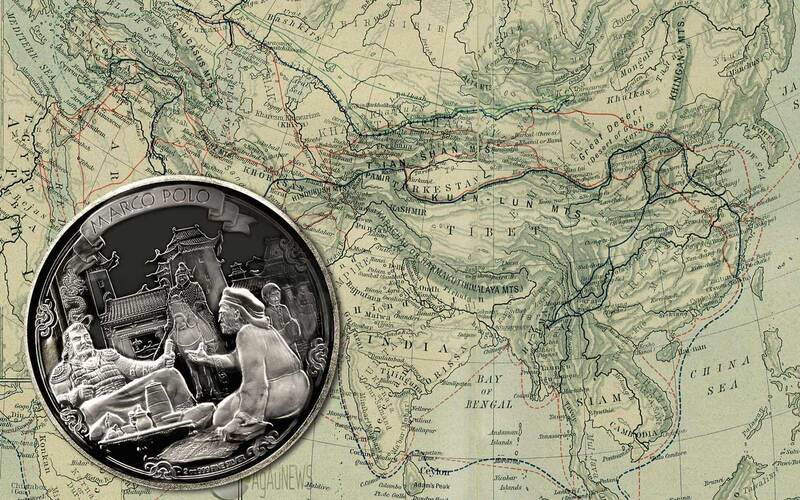 Marco Polo learned the mercantile trade from his father and uncle, who travelled through Asia and met Kublai Khan. In 1271, the three embarked on a journey which would lead to 17 years spent in China. 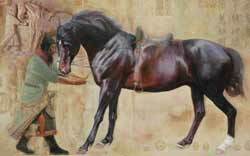 From his travels, Polo amassed great knowledge of the Mongol Empire. 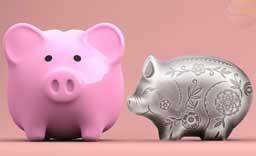 He marvelled at the use of paper money, and was in awe of its economy and scale of production. Soon after returning to Venice in 1295, war broke out with the rival city of Genoa. While in command of a ship, Polo was captured and imprisoned. It was during this period of time that he dictated stories of his travels to a cellmate. In 1299 he was released, and went on to become a wealthy merchant. While his writings were published in French, Italian, and Latin, few readers allowed themselves to believe his tales of strange lands far away. Although he was not the first European to reach China, Marco Polo’s detailed account of his experiences was ground breaking for its time. These writings went on to inspire Christopher Columbus and many other travellers. 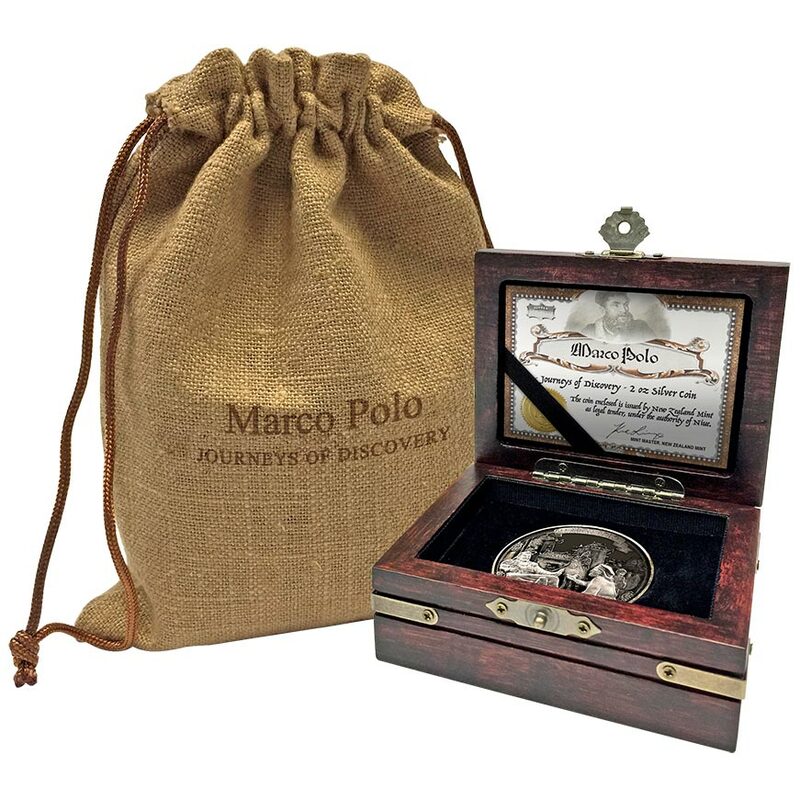 In the centuries since his death Marco Polo has received recognition that was not given during his life time, as much of his journey of discovery has been verified. 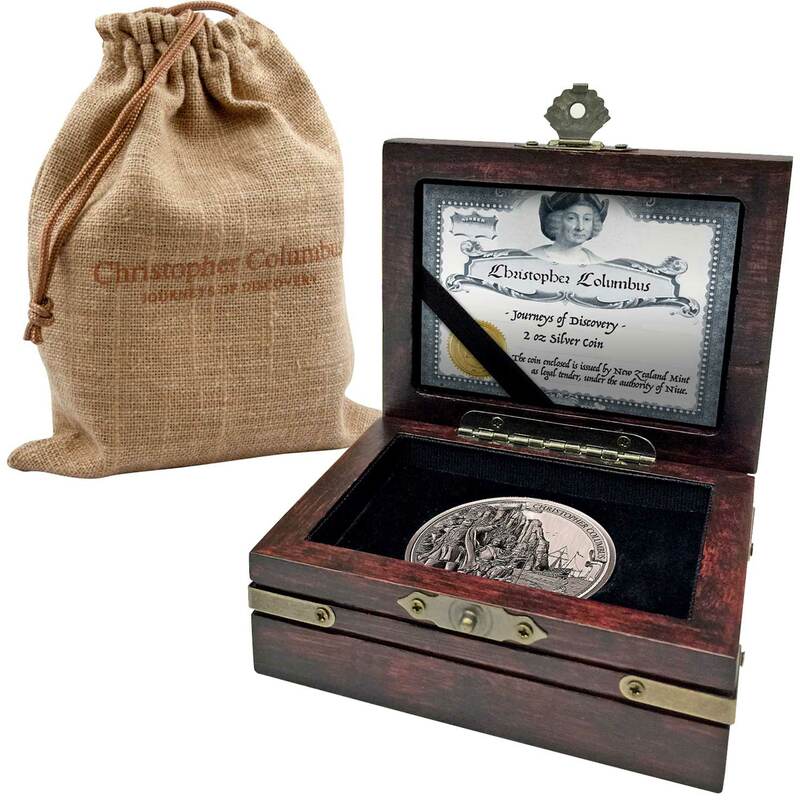 DESIGN: This beautiful fully engraved, high-relief coin has an antique finish. 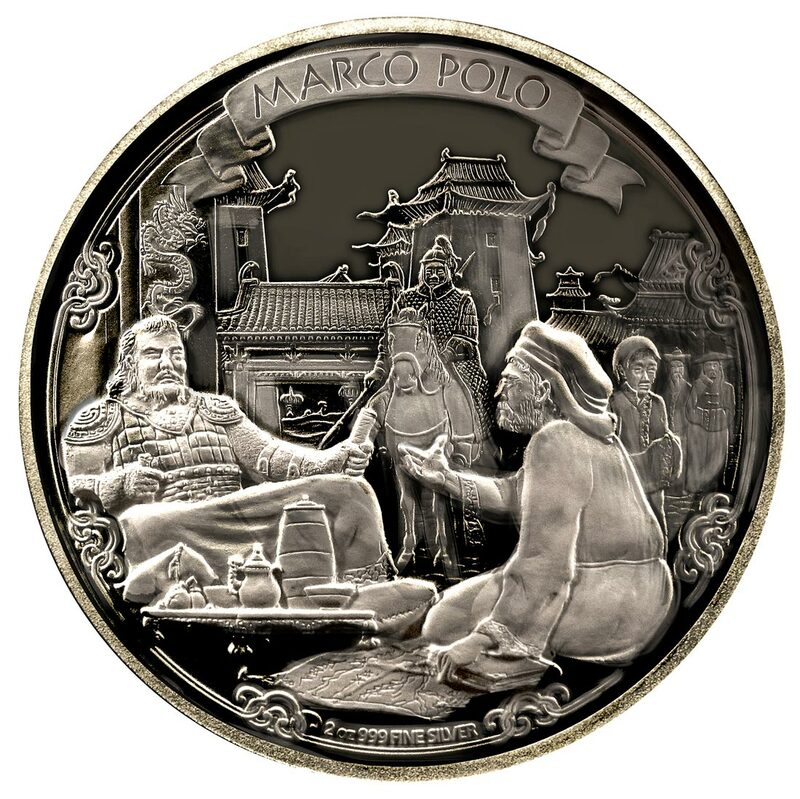 The illustration shows the moment of Marco Polo meeting the great Kublai Khan. 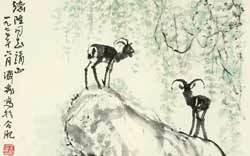 This scene is set in a stronghold of the powerful Mongol Empire which Polo marvelled so much at discovering. Explorer and navigator Christopher Columbus (1451 – 1506) was born in Genoa, Italy. Under the patronage of the Spanish royal family, he completed four voyages across the Atlantic Ocean. These efforts established permanent settlements and initiated Spanish colonization of the New World. Through this, Columbus has been credited as opening up the Americas to European trade. With economic competition between European kingdoms on the rise, Columbus proposed to reach the East Indies by sailing westward. This daring plan was seen as a chance to establish new trade routes with Asia. In August of 1492, after 36 days of sailing, Columbus set foot on an island in the modern day Bahamas, rather than Japan as he had originally intended. Returning to Spain a year later, Columbus gave a glowing, though somewhat exaggerated report and was warmly received by the Spanish court. Over the course of three more voyages, he visited the Greater and Lesser Antilles, as well as the Caribbean coast of Venezuela and Central America, claiming them for the Spanish Empire. Though we now believe Columbus was not the first European explorer to reach the Americas, his voyages generated lasting European contact with the New World. This inaugurated a period of European exploration, conquest, trade and colonization that was to last for centuries. 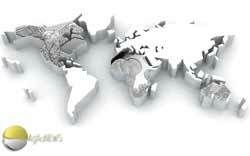 In what has become known as the ‘Columbian Exchange’, these expeditions set in motion a widespread transfer on a global scale. Foods from the Americas such as potatoes, tomatoes and corn became staples within Europe, while wheat from Europe became a main food source for people in the Americas. 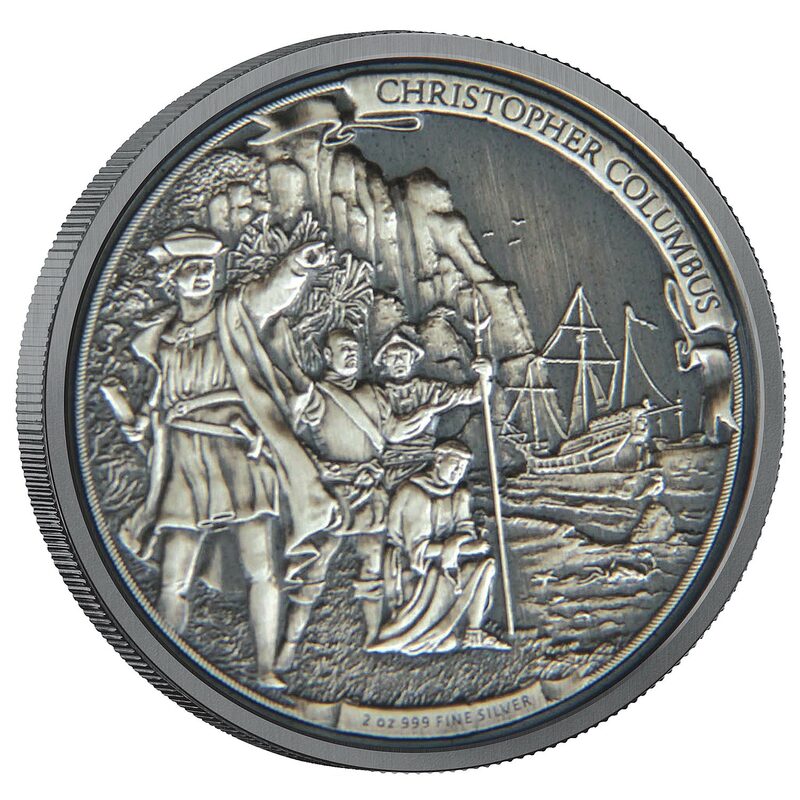 DESIGN: This relief engraved coin, shows the moment of Christopher Columbus landing on a beach in the New World. Vasco Da Gama was a Portuguese explorer who was the first man to sail from Europe to India, indirectly making the longest ocean voyage of its time. Born in 1460 in Sines, Portugal, little is known of da Gama’s early life. Despite coming from a noble family, his first love was the sea. Known as a tough and fearless navigator, in 1497 da Gama was appointed to command a Portuguese expedition to find a new maritime route to Asia. On 7 July Vasco da Gama set sail, taking advantage of prevailing winds by sailing south down the coast of Africa before rounding the Cape of Good Hope. 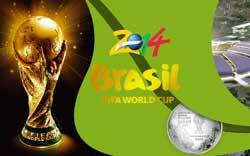 Sailing up the Eastern coast of Africa, da Gama reached the coast of India at Calicut (now Kozhikoda) in May of 1498. His success in this was to mark a key moment in the history of navigation. Da Gama had accomplished his mission, opening a trade route with the East by sea. Upon his return to Portugal in 1499 the King immediately dispatched a second expedition to secure a trading post at Calicut. Following a disastrous massacre of this second expedition at Calicut, da Gama once again sailed for India in 1502. Attacking Arab ships he met on the way, da Gama regained control and made peace. Back in Portugal, da Gama continued to advise the Crown on Indian matters, in return being granted exclusive privileges and revenues. In 1524, he was nominated Portuguese Viceroy in India, and sent to deal with growing corruption among Portuguese authorities there. Arriving in Cochin, he fell ill and died on 24 December of that year. It was not until 1539 that his body was taken back to Portugal for burial. Reaching India by sea helped the Portuguese Empire gain a monopoly on many products, some of which were new to Europe. This was to last for much of the following century. Da Gama’s discovery opened the way for an age of global imperialism, and established a long-lasting Portuguese colonial empire in Asia. His travels have gone down in history as a milestone which marks the start of global multiculturalism. 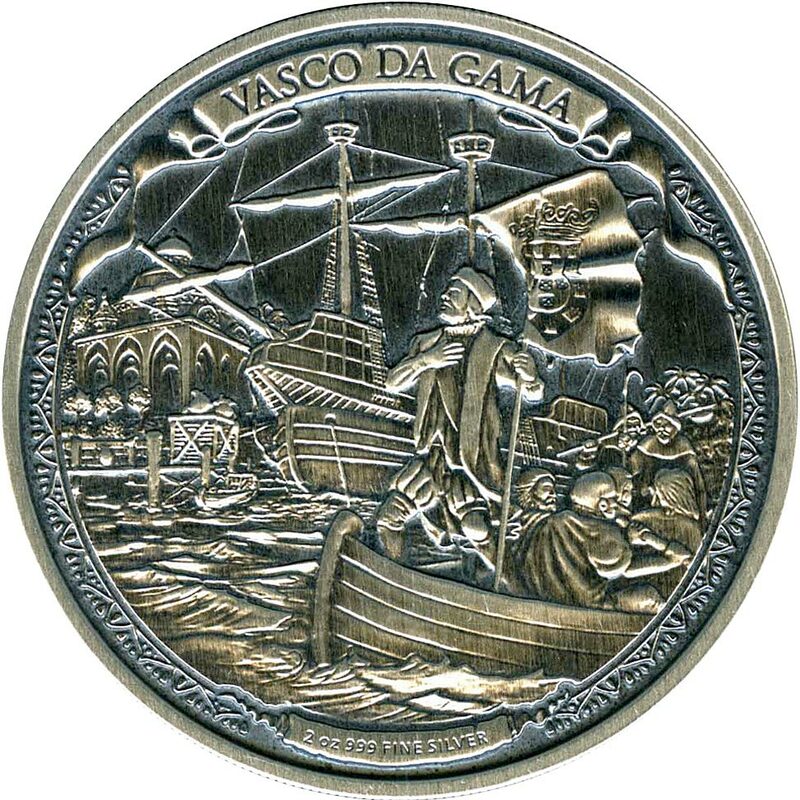 DESIGN: This relief engraved, antique-finished coin, shows the exciting moment of Vasco da Gama landing in Calicut, India for the first time on May 20, 1498. The scene is set with an engraved image of a temple on shore. 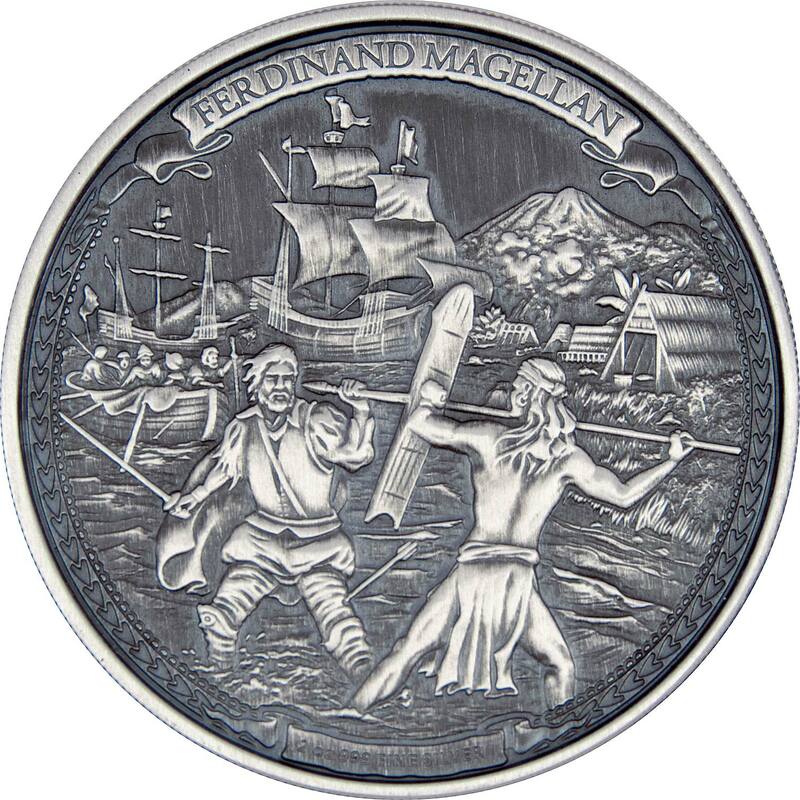 Portuguese navigator and explorer Ferdinand Magellan (1480 – 1521) is recognised as the man who, in the early 1500’s, led a fleet of Spanish ships on what is regarded as the ‘first circumnavigation of the world’. 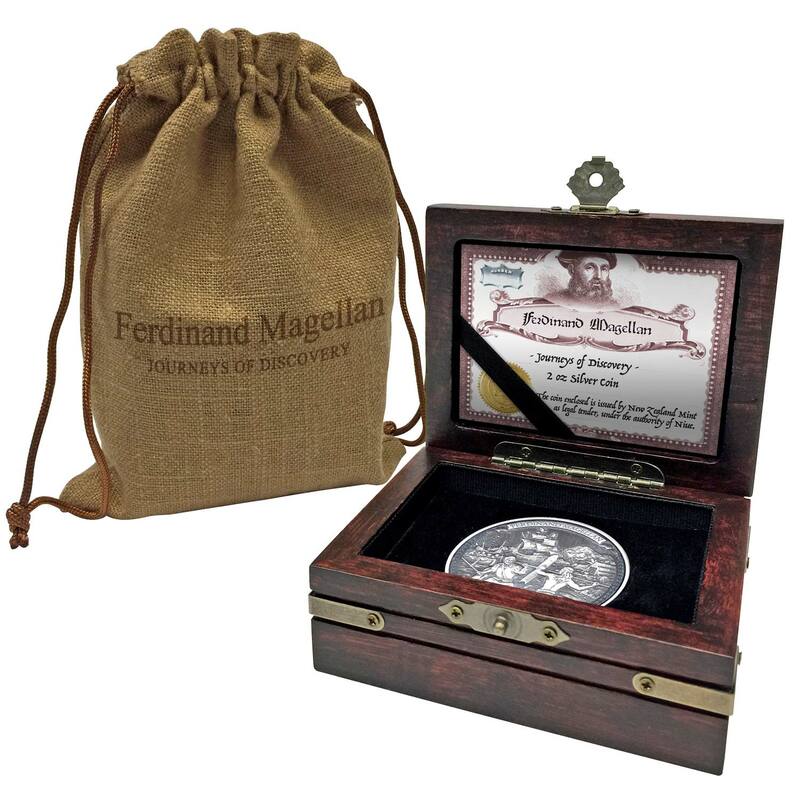 DESIGN: This intricate antique-finished, fully and high-relief engraved coin depicts the moment Magellan became fatally involved in a tragic local dispute, in the Philippines on 27 April 1521. 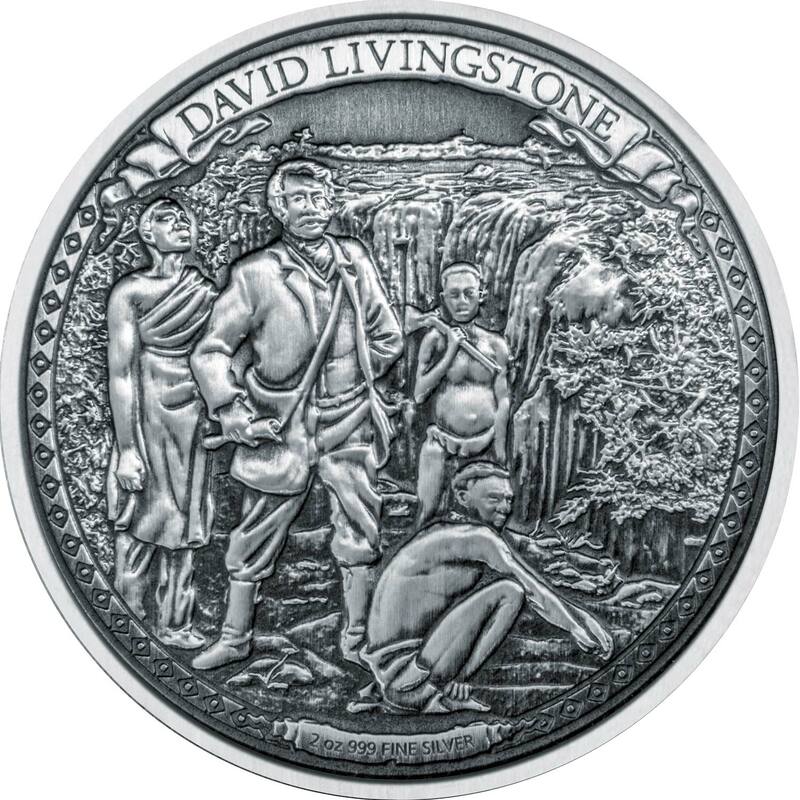 David Livingstone was a protestant missionary and a legendary explorer of the African continent, who was to become one of the most popular national heroes of Britain in the late 19th century. Born 1813 in Scotland, Livingstone grew up in poor conditions and was at the age of 10, working 12-hour days at a local cotton mill. Encouraged to get a good education, David went on to study medicine, followed by studies at the London Missionary Society. Livingstone’s travels to Africa between 1841 and 1873 have been well documented and after being posted to Africa first as a medical missionary in 1841, he was to make several travels to the ‘Dark Continent’ over the course of the next 30 years. His expeditions brought the West significant amount of knowledge about previously unknown parts of Africa. Livingstone was to be the first European to see the awe-inspiring Mosi-oa-Tunya (“the smoke that thunders”) waterfall during one of his early journeys inland in 1849, renaming it Victoria Falls. He was also the first European to cross the width of southern Africa, after completing his ambitious four-year expedition. David Livingstone died from dysentery and malaria in North Rhodesia (modern-day Zambia) on 1 May 1873, at the age of 60. His body was later buried at Westminster Abbey, England. DESIGN: This relief engraved, antique-finished coin, shows an artists’ interpretation of David Livingstone standing together with his exploration entourage, in front of the breathtakingly beautiful Victoria Falls. Charles Robert Darwin was one of the greatest naturalists of the 19th century, renowned for his contribution to the theory of evolution. He was one of the first to claim that man evolved from the ape, causing a furore at the time. Born in 1809 into a wealthy and well-respected family in England, Darwin grew up with an early interest in the nature. Young Darwin did not show much interest in education and left school at the age of 16. However, he went on to study at Christ’s College, and it was during this time that his previous interest in nature developed into a passion for natural science. 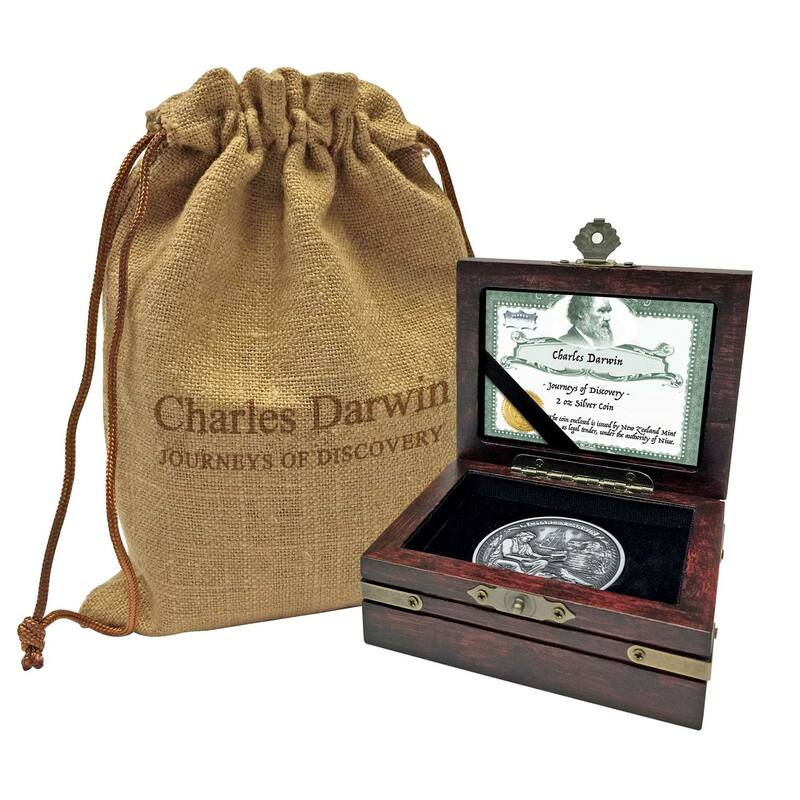 After graduating in 1831, Darwin first position was that of a naturalist on board the HMS Beagle, which was departing to take a five-year survey voyage around the world. During his voyage, Darwin had a unique opportunity to observe how the principles of botany, zoology, and geology translated to the field. He collected a vast number of plant, bird, and fossil specimens, documenting these with care. It was during this journey that he began to develop his novel and revolutionary evolutionary theory, which saw life forms evolving from simple to more complex forms over time. Darwin officially introduced his detailed theory of evolution to the Linnean Society of natural history in 1858. Charles Darwin died on 19 April 1882 and was buried at Westminster Abbey in London. After a life-time of research, his achievement was to literally have changed the way the western world viewed life. 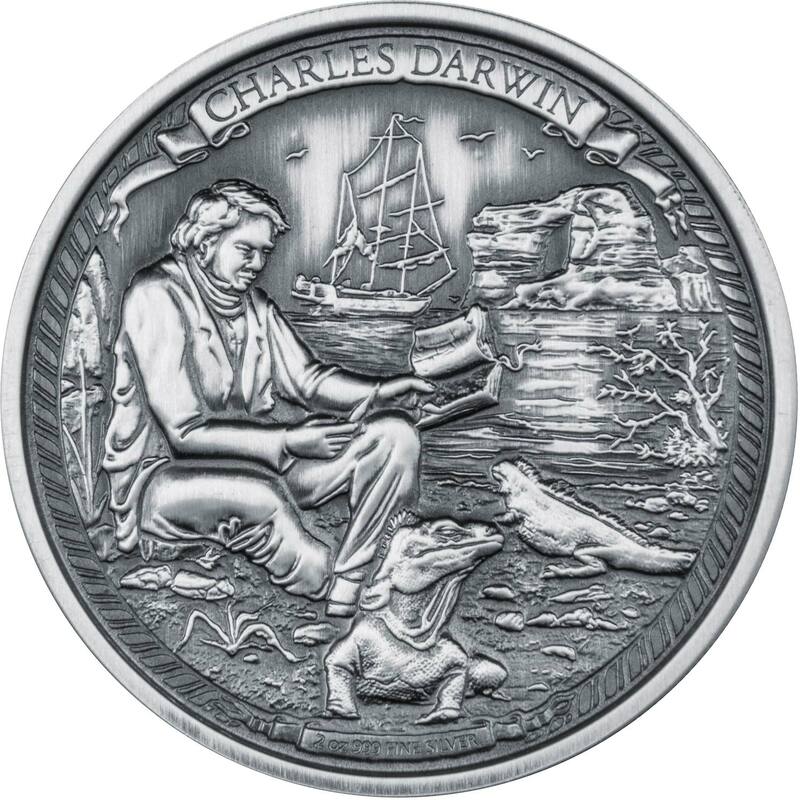 DESIGN: This antique-finished, fully engraved and high-relief 2 oz silver coin features a tranquil scene of Darwin studying his environment on a remote beach in the Galápagos Islands with iguanas by his feet. The HMS Beagle is moored in the background. Packaging for this series is of a very cool, innovative standard, well matched to the subject matter. Each coin is presented in a timber treasure chest complete with matching brass-style hinges and lock. The lid interior holds a uniquely numbered certificate of authenticity. All is packed in a protective draw string sack, modelled on those used to transport materials to trade around the globe. 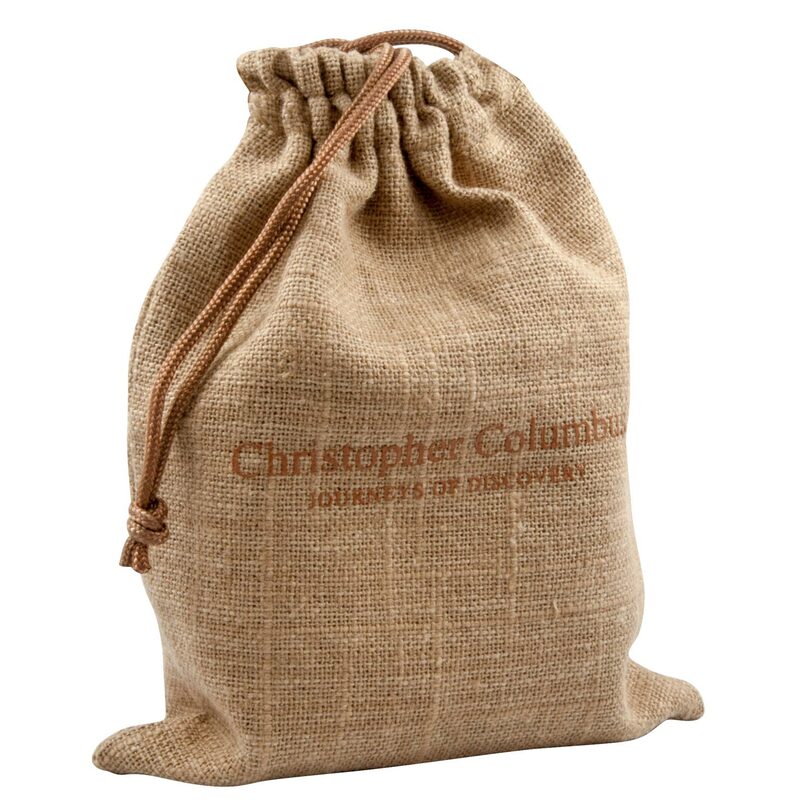 The coin name and the series are printed on the bag front. The obverse uses the Ian Rank Broadley effigy of Queen Elizabeth II, the newer Jody Clark one still remaining exsclusive to the Royal Mint. 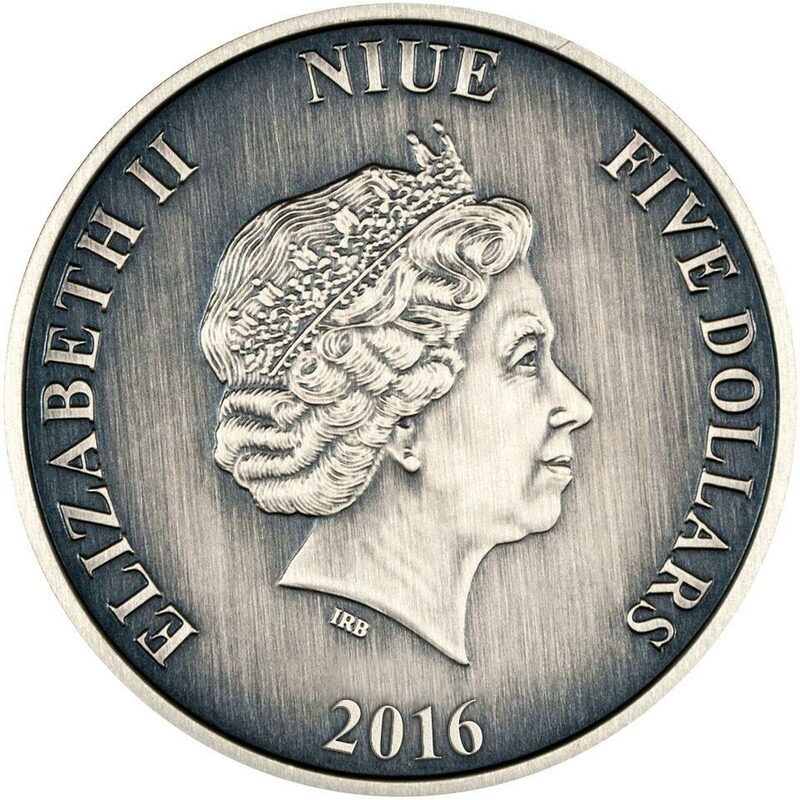 Inscriptions around the effigy detail her name (QUEEN ELIZABETH II), the issuer (NIUE), year of issue, and the denomination (FIVE DOLLARS). It’s also antiqued the same as the reverse face.